Here at Loving Your Pet we like to let sleeping dogs lie and that's because sleep is such an important part of your dog's routine. Did you know that on average, a dog will sleep for fourteen hours of the day? That's more than half! So it's important to create a place where it feels comfortable enough to fulfil its bedtime quota. Dog owners are becoming increasingly more willing to spend substantial sums on dog beds and perhaps that's where the wicker dog bed range fits in; a stylish and rustic bed that's craftsmanship is often reflected in the price. 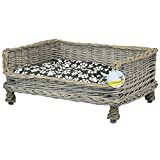 Wicker dog beds are hand made usually from willow and are recognised for their attractive woven appearance. The craft relied upon to produce the bed explains why some wicker dog beds cost in excess of one hundred pounds. Wicker dog beds are also about tradition; adding that olde worlde appearance to help maintain a room's antiquity. 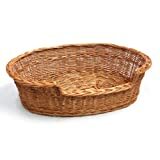 But don't be fooled by all the subtlety of the wicker craft, wicker dog beds are far from delicate show corner pieces, they are long lasting, sturdy and extremely durable - their quality second to none; which is why the feedback on them is excellent. 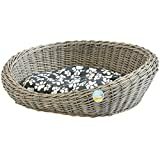 Wicker dog beds come in a range of sizes to suit your particular breed. Styles of bed vary from either square, corner or rounded options and most beds are raised on legs to make sure they escape the draft. 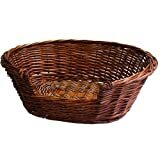 One of the more charming traits of wicker dog beds, are what the manufacturer's describe as natural tolerance - the wicker flexing and moving around your dog's body weight. Wicker also offers you an eco-friendly alternative to plastic and other man-made materials, making them the greenest dog bed on the market. Despite all of its charm, practicality and tradition, wicker dog beds still need soft linings or cushions to ensure your dog gets off to some restful sleep. You'll find hundreds of soft dog bed furnishings to choose from, both online and on the high street. Cushions and bedding that befit the luxury and workmanship of a wicker dog bed are available, but also at a price; sheepskin being a popular choice. Long-lasting and friendly to both your dog and the environment. 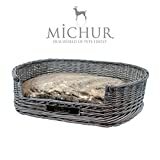 The only down side, if there is such a thing when it comes to wicker dog beds, is that their natural material (usually willow) can prove irresistible to dog's who like to chew - worth bearing in mind before you dash out and buy one!